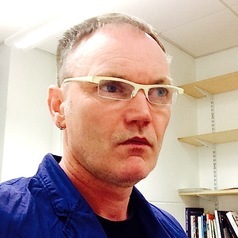 Greg Keeffe is an academic and urban designer with 25 years experience in sustainability, energy use and its impact on the design of built form and urban space. He is Professor of Architecture + Urbanism and Head of the School of Natural and Built Environment at Queens University, Belfast, UK. Previously he held the prestigious Downing Chair of Sustainable Architecture at the Leeds School of Architecture. Greg has extensive experience of working closely with architects and planners to develop exciting ways of re-invigorating the city through the application of innovative sustainable technologies, informing his work on the sustainable city as synergistic super-organism. In this way, he has sought to develop a series of theoretical hypotheses about our future existence on the planet, through a series of technological and spatial interventions. Most of his work comes out of a free-thinking open-ended discussion about how things should be. He is author of the books ‘Means Means Means’ and ‘Urban Evolutionary Morphology’; which develop a model of a new city, that is a cyborg created out of mutually compatible, technological and biological functional elements. Greg is The Head of the School of Natural and Built Environment at Queens. He is an active Fellow of the Royal Society of Arts, and also a member of the International Federation of Housing and Planning and the International Solar Energy Society. Greg holds visiting positions at TU Delft, Keio University, ORT Uruguay. At TU Delft Greg works closely with the Climate Design Division in the School of Architecture, with whom he currently has a joint EU FP7 Grant. Since Fall 2013 Greg has held the Strauch Visiting Professorship in Sustainable Architecture at Cornell University. In the School of Art Architecture and Planning, he taught a studio called 'Crash Test'. The focus of the Studio was infrastructures in the city, and new sustainable infrastructures could be inserted in the exisiting city to make new urban synergies. In Fall 2015, Greg ran a second studio at Cornell with Michael Jefferson entitled Evo Devo which looked at applying the ideas of evolutionary development to the design of the contemporary city. The studio focussed on projects in Buffalo NY. Greg currently is the Sustainability and Architecture advisor to the Northern Ireland Assembly Ministerial Advisory Group. In 2014, he received Paper of the Conference award at Passive and Low Energy Architecture 2014, for his paper on his climate-proof modular house, the IDEAHaus. The same year, Greg was appointed an EU Expert Advisor, and has in this capacity been involved in the assessment of Horizon 2020 research projects in urbanism, climate change and renewable energy. Greg is a three-time RIBA competition-winner.